As we head into 2018, we're delighted to share with you the first of many enhancements to plotaroute.com that we hope to introduce throughout the year - three brand new map layers. 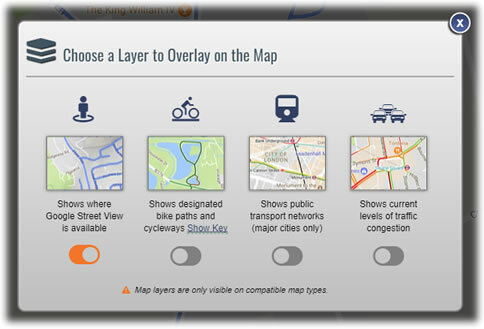 Each of these layers can be activated to show additional information on top of your route map, like levels of traffic or street view coverage. They are all available by clicking on the new map layer symbol when plotting or viewing a map and can be accessed on both the desktop and mobile versions of the website. Google Street View is a very useful tool for checking the suitability of roads before you head out on them. It gives you a 360° photographic view from street level and has been a popular feature on plotaroute.com since the site was launched. We've now upgraded these Street View capabilities even further by adding a separate map layer to highlight all roads that have a Street View option. Looking at Street View coverage in this way can help to identify roads that are suitable for road bikes, as Street View coverage is almost entirely on roads used by motor vehicles. The new Transport map layer displays public transport networks in major cities across the world, on top of a Google street map. Lines and stations are easily identifiable, so this should help to plan connections if your route is away from home in a major city. The new Traffic map layer shows the current levels of traffic on a Google street map, without having to launch a separate application, enabling you to easily check the traffic on your route before you head off. The existing Bike Paths layer is still available and can now be accessed in the same way as the other map layers. We hope you'll find these new features useful. Lastly, we'd like to take this opportunity wish you a very happy and healthy 2018.